All five films in the collection have been recently restored by Universal. The legendary Marx Brothers - Groucho, Harpo, Chico and Zeppo - made their motion picture debut in the outrageously funny adaptation of their Broadway play The Coconuts. Groucho portrays the owner of the Hotel de Cocoanut who tries to fleece everyone from innocent bellboys and bellgirls to wealthy society matron Mrs. Potter (Margaret Dumont). Chico and Harpo play resort hotel con men who arrive with empty suitcases they plan to fill by robbing guests. Featuring elaborate musical productions with music by Academy Award winner Irving Berlin, this comedy treasure includes some of the Marx Brothers' best stage routines, such as Groucho's land auction, the excruciatingly funny 'viaduct' dialogue and Polly Potter's engagement party. Filled with comedy sketches, musical numbers and plenty of gags, Animal Crackers is often regarded as the Marx Brothers' most quoted film for its witty and unforgettable dialogue. Groucho stars as Captain Spaulding, a famed African explorer who is being honored at a high society party at the estate of Mrs. Rittenhouse (Margaret Dumont). Mayhem and chaos ensue after a valuable painting disappears and Spaulding, along with the Professor (Harpo), Signore Emanuel Ravelli (Chico) and Horatio (Zeppo) "help" search for it. Highlighted by musical performances including "Hooray for Captain Spaulding" (which would later become the theme song to Groucho's popular TV series You Bet Your Life), this classic comedy earned a place on the AFI's 100 Years...100 Movie Quotes list. 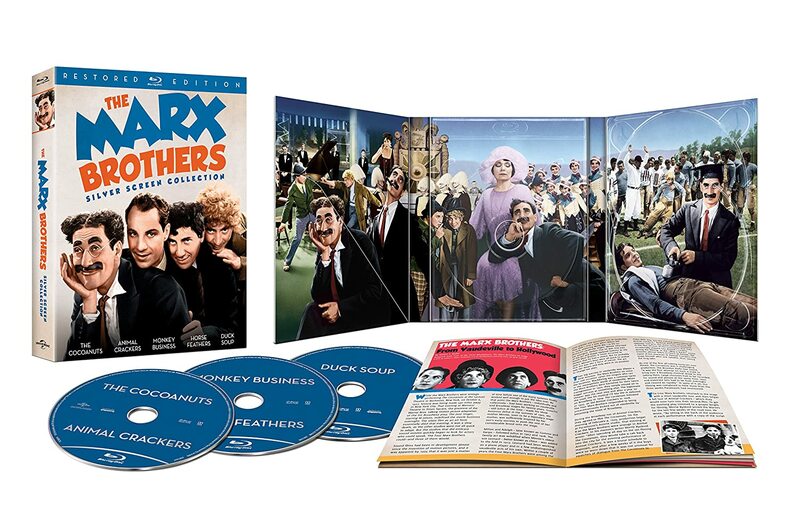 The iconic Marx Brothers - Groucho, Harpo, Chico and Zeppo - head for the high seas in the outrageously funny Monkey Business. While hiding from the authorities on a luxury cruise ship, a quartet of stowaways inadvertently find themselves posing as bodyguards to rival gangsters. Complete lunacy ensues as the brothers get mixed up in a kidnapping and must save the day. Featuring some of the legendary comedy team's wackiest scenes ever, including all four brothers each trying to pass themselves off as real-life actor Maurice Chevalier; this unforgettable film earned a place on the AFI's 100 Year...100 Laughs list. The four Marx Brothers - Groucho, Harpo, Chico and Zeppo - are at the top of their game in the uproarious parody of college life, Horse Feathers. As president of Huxley College, the fun-loving Professor Wagstaff (Groucho) attempts to help his son (Zeppo) finally graduate after 12 years by arranging to "buy" professional football players for an upcoming big game against rival Darwin University. The plan takes an unexpected twist, however, when a bootlegger (Chico) and a dogcatcher (Harpo) are mistaken for the athletes and accidentally hired instead. 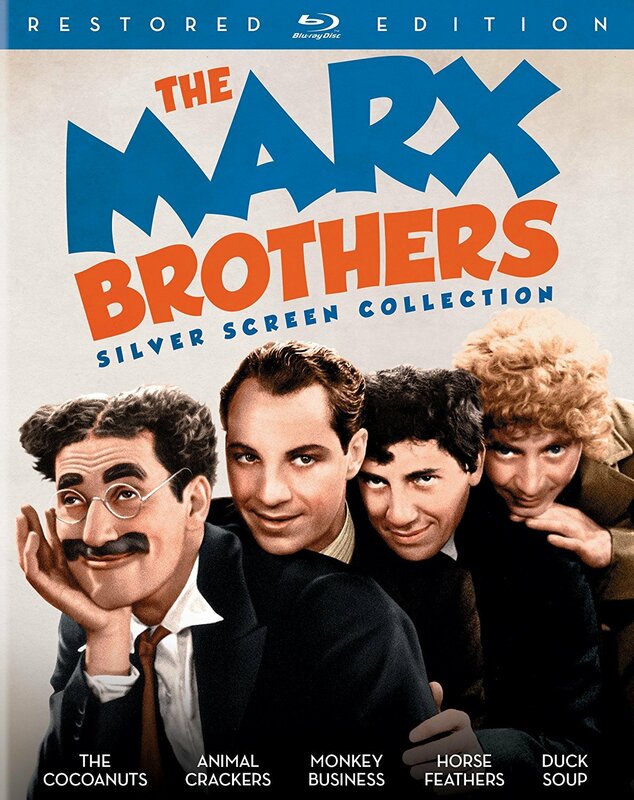 Featuring their trademark insanity, including a climactic football sequence that has to be seen to believed, this quintessential Marx Brothers' comedy earned a place on the AFI's 100 Years...100 Laughs list. Groucho, Harpo, Chico and Zeppo Marx are at their very best in the political satire Duck Soup which is often regarded as the comedy legends' funniest and most popular film. After being appointed dictator of Freedonia, Rufus T. Firefly (Groucho) proceeds to bring the mythical nation to a halt by showing up late and insulting everyone at his inauguration. Hoping to oust the unfit new leader, two spies (Harpo and Chico) are sent from the neighboring Sylvania. Soon enough, war is declared between the two nations with outrageous results. Recognized on the AFI's 100 Years...100 Laughs list and selected for the National Film Registry, this comedy classic features some of the most hilarious sequences ever filmed, including the famous mirror sequence and final battle scene, and remains as entertaining and relevant today as it did when it was first released in 1933.